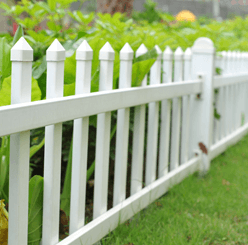 Call or email our office to schedule a free onsite fence estimate. Our flexible sales staff is available to meet with you after hours or even on the weekends. Once you are ready to proceed with the fence project we require a signed contract. You can email, mail, fax or hand deliver the contract. We also require 50% down can be paid in cash, check, or all major credit cards. Apply for a fence permit from your local township. Most townships will require a copy of the contract to process the permit. If you live in an unincorporated are you can obtain the permit from your local county zoning department. Also obtain permission from a neighbor or homeowner association if it is required. Once the contract and down payment have been received materials will be ordered and you will be put on the schedule. Depending on the time of the year and material availability a rough idea on installation will be given. Hohulin will call and have J.U.L.I.E mark the property for all public utilities. If there are any private utilities located on your property it is your responsibility to have those marked. Ex. Sprinkler system, sump pump, lighting, etc. It is suggested that you be present the first couple hours of the installation so that you can walk through the layout with the installers. If you cannot be present fence layouts will be discussed in detail between our sales staff and installers. Although Hohulin attempts to install the date that it was scheduled, all installations are subject to weather conditions.